During a recent campaign stop, presidential candidate Hillary Clinton promised to make the "quiet epidemic" involving heroin and prescription opioids an important part of her presidential campaign -- and, presumably, of her presidency, should she be elected. She mentioned the issue of substance misuse again in her highly publicized speech on criminal justice reform last week. As someone intimately familiar with the devastating impact of this public health crisis on individuals, families and communities, I was very pleased to hear this, and thought of several ways she could make good on her pledge. Here are five simple steps Clinton could take, as candidate or President, that could significantly shape the course of opioid addiction in the United States. 1. Define the problem in the right way. All too often we hear the problem labeled as a prescription drug abuse crisis or heroin abuse crisis. Using language like this is not only inaccurate, but also misleading. It suggests that the main problem is people behaving badly by using dangerous drugs for recreational purposes. In reality, the reason opioid overdose deaths are at historic levels and the reason heroin is flooding into non-urban communities across the country is because the number of Americans who have developed the disease of opioid addiction -- both from non-medical (a.k.a., "recreational") and medical use -- has skyrocketed: From 1997 to 2011, the number of Americans seeking treatment for addiction to opioid painkillers increased by 900 percent. I don't mean to suggest that everyone who dies of an accidental opioid overdose was suffering from addiction. There are a significant number of deaths occurring in people who were experimenting with recreational opioid use, and there are also many deaths in pain patients who were not addicted. But several studies have shown that the vast majority of deaths are occurring in people who had developed opioid addiction from repeated exposure to opioid painkillers. While some of these opioid-addicted individuals developed the disease from non-medical use, there are also many who became addicted while taking opioids exactly as prescribed. When the opioid crisis is correctly framed as an epidemic of opioid addiction, the strategies for controlling the problem become clear -- and they are very similar to the strategies we would employ for other disease epidemics. We must prevent new cases of the disease (mainly by getting the medical community, including dentists, to prescribe more cautiously) and we must see that individuals suffering from the disease are able to access effective treatment. 2. Understand how we got into this mess. The U.S. Centers for Disease Control (CDC) has been perfectly clear about the cause of this public health crisis. 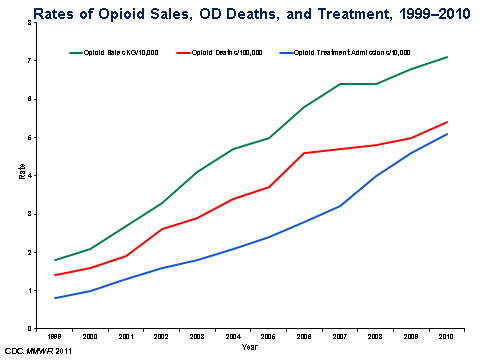 The CDC has explained that as prescriptions for opioids started to soar in the 1990s, parallel increases in rates of addiction and overdose deaths followed (see graph). The huge uptick in prescriptions reflects the medical community responding to an industry-funded campaign that grossly minimized risks of long-term opioid use, especially the risk of addiction, while exaggerating its benefits. Doctors were now being taught to believe that the compassionate way to treat any complaint of pain was with an opioid prescription. When I was in medical school, one thing I was told was completely wrong. The one I was told was, if you give opiates to a patient who's in pain, they will not get addicted. Completely wrong. Completely wrong. But a generation of doctors, a generation of us grew up being trained that these drugs aren't risky. In fact, they are risky. 3. Enforce the Federal Food and Drug Cosmetic Act. If Hillary Clinton becomes President, one of the most important, concrete and effective steps she could take to stem the rising tide of opioid addiction would be to enforce an existing federal law -- the Federal Food and Drug Cosmetic Act -- that prohibits drug companies from promoting medications for conditions where risks outweigh benefits. If the FDA had been enforcing this law all along in regard to opioids, drug companies would never have been permitted to market long-term opioid use for common chronic conditions like low back pain, and we might have avoided this public health catastrophe. Until drug companies are prohibited from falsely promoting opioids as safe and effective for long-term use, it will be very hard to end the overprescribing that fuels this crisis. The CDC will have a much easier time convincing doctors to prescribe more cautiously if the FDA starts enforcing this law. 4. Lift the cap on the number of patients a physician can treat with buprenorphine. Buprenorphine is a medication that controls opioid cravings and allows addicted individuals to function normally; it is literally a lifesaver. Unfortunately, buprenorphine treatment capacity does not come close to meeting demand -- and one reason for this is entirely and quickly fixable. Strict caps limit the number of patients a physician may treat with this medication. Lifting the cap would immediately enable physicians to deliver this effective treatment to more patients. The Secretary for Health and Human Services has the ability to lift the cap unilaterally. Clinton could have this done on her first day as President if she wanted to. While campaigning for President, Clinton has an opportunity to help raise awareness about the impact of the opioid addiction epidemic and to call for desperately needed federal funding to assist state and local governments in tackling the problem. "I have to tell you," Clinton recently told a woman who mentioned the growing drug problem in her community, "before I went to Iowa last week I wasn't aware of the depth of feeling people had about substance abuse issues." With millions of Americans now suffering from opioid addiction and thousands dying each year from overdoses, that's a shame. In 2013, a record 44,000 Americans lost their lives to an accidental drug overdose. That's about the same number that died from AIDS during the height of the HIV epidemic in 1995, and yet public attention and resources to end the opioid addiction epidemic are sorely lacking. The world is listening to Clinton right now. It's the perfect time for her to create a rallying cry against this "quiet" epidemic.